It was a long week of spilling all the beans on my visit to the set of Ender’s Game last year and I definitely think all that word spewing burnt me out. I’ve still got one last report and you can bet the best has been saved for last. Or rather, the best for me. Not that meeting everyone else wasn’t just flat out amazing, but keep in mind we were at the end of a full day on set. They were going to stick us back in the van and take us back to the hotel. I was looking around for something to tie myself down to so that I could insist that I had to stay longer. Then they announce that Sir Ben Kingsley is willing to give us ten minutes of his time between scenes. They led us to a some dark formic room on the Eros set that had already had the lights removed. It was stifling in there and we simply waited for him to arrive. I suddenly found myself suffering from some weird kind of anxious terror. What in the heck do you ask a knighted actor you’ve seen in movies all your life? After a while, footsteps echoed down the hall and suddenly Mazer Rackham walked into the room. 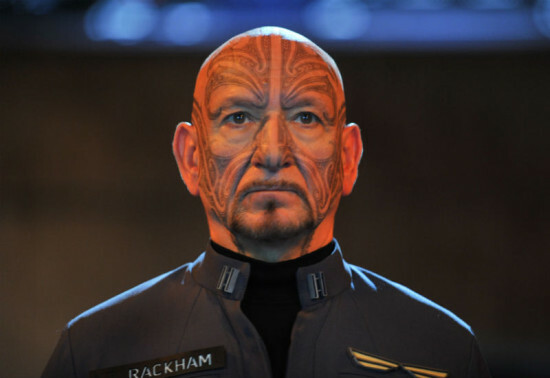 Now, we’d already seen a photo of Sir Ben Kingsley in his Maori tā moko makeup, but for some reason I was expecting just the actor. So when he walked into the room in full makeup and costume, I went from anxious terror to dizzying terror. He sat down on a stool and in a really weird moment, we suddenly all swarmed around him, recorders in hand. “So your tattoo must have hurt really bad.” joked a woman in our group. I feel I should note that this question I asked him became one of the most memorable parts of my time on set. I don’t know if it was because he was still slightly in character, having just walked off the set, but when he spoke to me he locked eye contact with me and I felt like he was somehow staring into my soul. I felt paralyzed until he looked at someone else. He simply looked that intense. And that was something we were all more than happy to do. This concludes EnderWiggin.net’s ‘Straight from the Set’ reports. We hope you’ve enjoyed reading all about our time on the Ender’s Game set!